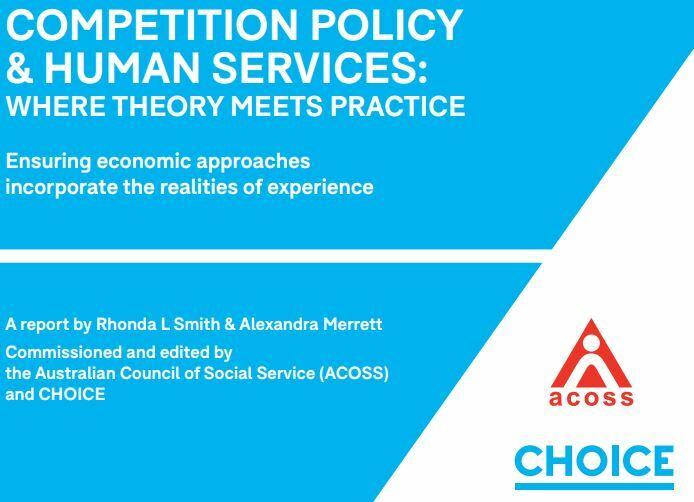 CHOICE and ACOSS have released a report on Competition Policy and Human Services, assessing two areas of human service where various combinations of choice, contestability, and competition have been significant in recent years - vocational education and training (VET) and employment services. The report examined outcomes achieved when different levels of competition have been in place, and researchers found that the competitive models introduced in these two sectors have largely failed to deliver better outcomes for consumers, and have caused major barriers to improving collaboration. ACOSS CEO, Cassandra Goldie, said "In employment services, ‘marketised’ service delivery has led to private providers focusing their efforts on people who are job-ready rather than people who need more assistance. That’s part of the reason why so many people remain unemployed for 12 months or more. Further, choice for people who are unemployed is severely restricted by the harsh benefit compliance system, which employment service providers play a major role in administering. The current model of employment services, and its predecessors, have left people behind. “Finding examples of human service delivery areas where more intense competition or contestability leads to better services is challenging. All too often, any benefits are outweighed by new risks imposed on service users such as high turnover of service providers and the cost-cutting strategies often pursued by for-profit services." Findings of the report echo WACOSS' view, in that people are not necessarily better off when competition is introduced. Poverty has remained stubbornly high since the 1980s, with the relative poverty rate hovering around 10% since 1988. The report from the Productivity Commission earlier this month, Rising Inequality? A Stocktake of the Evidence, doesn't paint the picture that we are seeing in WA. The report claims that economic growth has made everyone in Australia in every income group better off, which isn't necessarily the case at all, and has drawn criticism from publications such as The Conversation and The Sydney Morning Herald, among others. 1% of people remained in the same financial situation, and more than 40% of the Australian population were in a lower income group in 2016, than in 2001. Single adults on Newstart have fallen down the income distribution, from the bottom 10% to the bottom 5%. The report is at odds with the research from the Australian Council of Social Service (ACOSS) released on Inequality in August. Nominations are now open for the 2018 Infinity Awards. The awards acknowledge and celebrate the outstanding achievements of Western Australians working towards a better waste future through improved waste practices and innovative waste solutions. All not-for-profits and community service organisations are encouraged to apply and showcase their outstanding work in this area. Nominations close at 5pm Tuesday 9 October 2018. Shortlisting of nominations and judging will take place from mid-October, ahead of a gala dinner and awards presentation at the Westin Perth on Thursday 15 November 2018. For more information about the Infinity Awards, visit wasteauthority.wa.gov.au or contact the awards organisers on 9421 3600 or infinityawards@millswilson.com.au. The awards are an initiative of the State Government of Western Australia and are coordinated by the Waste Authority WA. The Youth Affairs Council of Western Australia (YACWA) have been funded by the Department of Communities to facilitate consultations with the community sector, local government, and Aboriginal organisations, to support the development of an Action Plan for At Risk Youth (Action Plan). The Action Plan will align with the WA Youth Strategy and the 10-Year Strategy on Homelessness. Services working with at-risk youth are invited to attend one of the workshops, on Monday 8, or Tuesday 16 October. Email thomas.fleming@cpfs.wa.gov.au or phone 9222 2829. Download the Advocacy Toolkit, recently produced and designed by WACOSS and the DropIN Solutions team. The toolkit is divided into sections with tips and templates on writing letters to government, how to write and distribute media releases, and ideas for setting up face-to-face meetings with politicians. The toolkit is a resource to enable and empower anyone to be an advocate for change. Hard copies can be provided on request. Community sector organisations may be interested in participating in the Local Government Act review, to have your say on issues like community engagement and integrated planning. Surveys will be open until 31 March 2019. Organisations and individuals can have their input on homelessness in Western Australia, as part of upcoming consultation sessions. Feedback will inform the development of the 10-Year Strategy on Homelessness (the Strategy). Led by the Department of Communities, the Strategy will be a whole-of-community plan to tackle homelessness in WA. The consultation sessions will be held in Broome, Kununurra, Kalgoorlie, Geraldton, Port Hedland, Bunbury, Albany, and in Cockburn, Perth CBD, and Joondalup from the end of September. Nominations are now open for WA Youth Work Awards, ahead of International Youth Work Week, 5-11 November 2018. The week is an opportunity to acknowledge the work of our youth workers in the sector. Nominate someone for an award, in one of the four categories which include: Emerging Youth Worker Award, Regional WA Youth Worker Award, Professional Youth Worker Award, and Significant Contribution to Youth Work Award. The Pilbara awards have been created to recognise the outstanding contributions made by Pilbara organisations and individuals through hard work, determination, and passion, which have a positive impact on Pilbara communities. Nominations are open until Friday 29 September 2018, and will be announced at the Gala Dinner on Friday 2 November at the Dampier Community Hall. In response to the WACOSS Regional Training Needs Survey the next round of Lotterywest-funded free regional training will include Working with Complex Trauma and Working With Challenging Clients. The workshops will be delivered by WACOSS training partner SARC. Some spaces are still available in Esperance, Geraldton, but workshops are filling fast! With the opt-out period extended to Thursday 15 November, The Australian Digital Health Agency is holding further briefing sessions to continue raising awareness in the community and to support peaks and community organisations. There are two briefings available, 11am-1:00pm, and 6:00-8:00pm, Wednesday 3 October, Level 1, Cloisters, 863 Hay Street, Perth. Social isolation can affect all aspects of health and well-being. Improving social connections and promoting an active lifestyle positively influences physiological health, mental health, cognitive function, self-esteem and sense of meaning- leading to healthy ageing. 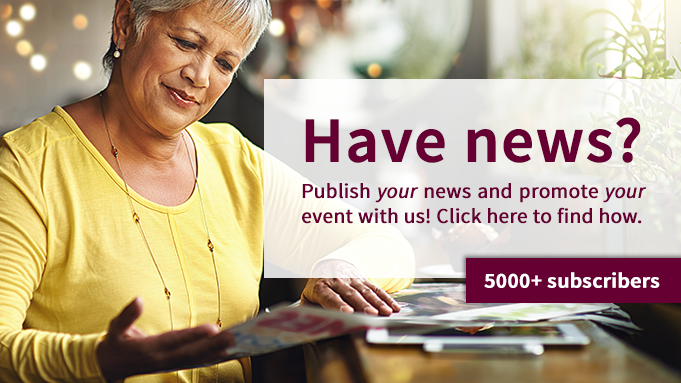 Join Know Injury as they address how to promote well-being and reduce social isolation among older adults, with presentations by Dr Julie Dare, Curtin University; Jackie Tibbets, Consultivation; and Caroline Jackson Pierce, Mentally Healthy WA; 9am-11am, Friday 5 October 2018. The Consumer Protection Awards provides an opportunity to reward and recognise the achievements of individuals, non-government organisations, businesses, local governments, journalists and media outlets that have increased awareness of consumer issues, provided support for disadvantaged consumers or contributed to injury prevention for children. Potential nominees may have helped consumers with tenancy matters, scam prevention, debt management or understanding contracts. Nominations are open until Friday 16 November. The WA Police Force invites incorporated not-for-profit organisations and local government authorities to apply for grant funding under the 2018-19 Community Crime Prevention Fund. Grants of up to $25,000 per project will be available for projects that address an identified priority of the Community Crime Prevention Fund. Curtin University will host the Australian Ally Conference with the theme Activating Human Rights: Sexual Orientation, Gender Identity and Intersex Status - Leading the Change, from 27-28 September. Speakers include Disability and LGBTI/Queer Rights Activist Jax Jackie Brown, Nick Lawrence, Founder of Transfolk of WA, and Sam Winter, Transgender health and rights scholar at Curtin University, among others. While the achievement of marriage equality was a high point in the struggle for human rights of LGBTIQ+ people, this accomplishment still does not mean all people enjoy the same rights, and the public debate exposed some entrenched social, cultural, political, economic, and other forms of discrimination and harmful attitudes. There is more to do for human rights of all LGBTIQ+ people. Are you planning a Conference or a major event and need to quote all the design and printing of your promotionals? WACOSS DropIN Solutions has an affordable option offering all the tailored graphic design solutions you will need, not only for your event, but over a year to fit your purpose. This option is just $4,500 and can be purchased now for use throughout 2018-2019. WACOSS Members receive a $500 discount. Want to know more? Contact Jaime our DropIN Project Officer at jaime@wacoss.org.au or at 9420 7222. 11 OCT | Mental Health Forum - Let's Talk About It!